This chemistry dictionary offers the chemistry definitions starting with the letter X. These glossary terms are commonly used in chemistry and chemical engineering. Click the letter below to find the terms and definitions beginning with that letter. xanthophyll – Xanthophyll is a class of carotenoids that are yellow pigments. Examples: The yellow in fall leaves is due to xanthophyll molecules. xenobiotic – Xenobiotic is any chemical that would not normally be found in a living organism or be expected to be produced by it. Examples: organs that are transplanted across species, genes from different organisms, dioxin in humans, antibiotics in humans since we do not produce them ourselves. xenon – Xenon is an element with an atomic number of 54 and atomic weight of 131.29. It is an odorless inert gas that is used to fill cathode ray tubes. 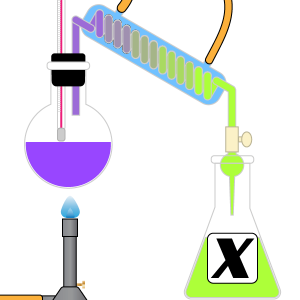 X group – ‘X’ is used to denote a halogen in the structural formula of a molecule (usually organic). x-rays – X-rays are light rays with a wavelength from 0.01 to 1.0 nanometers. x-ray crystallography – X-Ray Crystallography is an analytical method in which x-ray diffraction patterns are used to determine the three-dimensional arrangement of atoms in a crystal. Many crystals used for x-ray crystallography are less than 1 millimeter in diameter. x-ray diffraction pattern – X-Ray Diffraction Pattern is an interference pattern created by x-rays as they pass through a material, such as a crystal. x-ray spectrum (x-ray spectra) – An x-ray spectrum (plural: x-ray spectra) is a set of x-ray frequencies emitted by a target in an x-ray tube. The atomic number of an element correlates to the x-ray frequencies; each element produces a characteristic x-ray spectrum. Example: X-ray spectra are used in x-ray spectroscopy to characterize samples based on their reaction to x-ray excitation. These often are used to determine atom placement in a crystal lattice. x-ray tube – An X-Ray tube is a type of cathode ray tube that focuses electrons onto a metal target, thus causing the metal to emit x-rays. x unit – An x unit is a non-SI unit of length equal to 100.21 x 10-15 meters. The unit is used in x-ray crystallography.